We updated the song because we’re getting ready for 2016, getting rid of the old and holding onto the best spots to party it up in Vegas. This New Year’s, we’ll have a lot of parties. Like, think about the number of parties you could conceivably go to in one night, then multiply that by all of the parties anywhere ever – that’s what we’re talking ‘bout. Since we didn’t want this blog post to be longer than the director’s cut of a Lars von Trier film, we’ve selected a few parties that you should know about, so you can make an informed decision about where to spend your midnight. Note: None of these parties will be as scandalous as a Lars von Trier film. But they will be a lot of fun. NYE at FSE 2014, and other abbreviations. Photo courtesy of Fremont Street Experience. They’re calling it TributePalooza, because adding palooza to the end of something always makes it better. The only thing that would be more awesome would be a PaloozaPalooza, but we can’t even handle that. 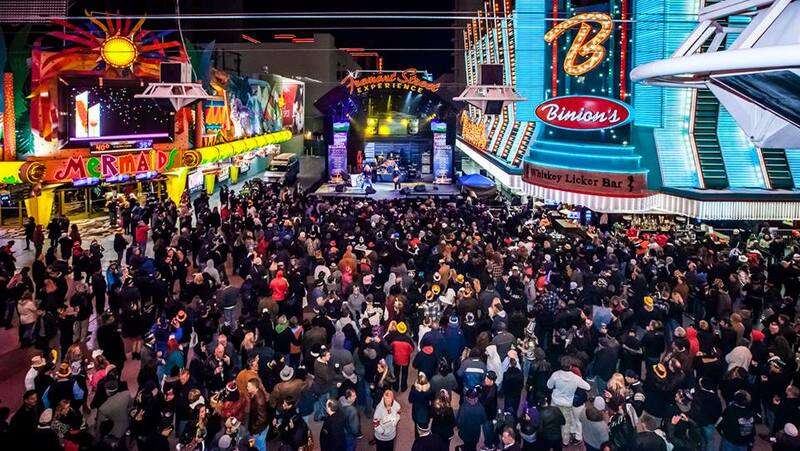 Fremont Street Experience is always a party, whether it’s the first day of a new year or the first time you’ve seen an old man in a Speedo – first and only, we hope. This year, the space will be a wide open extravaganza where the air may be chilly but the throngs of party-goers will surely heat you up. This is a great option if you don’t want to be crammed in a club but still want some excitement. 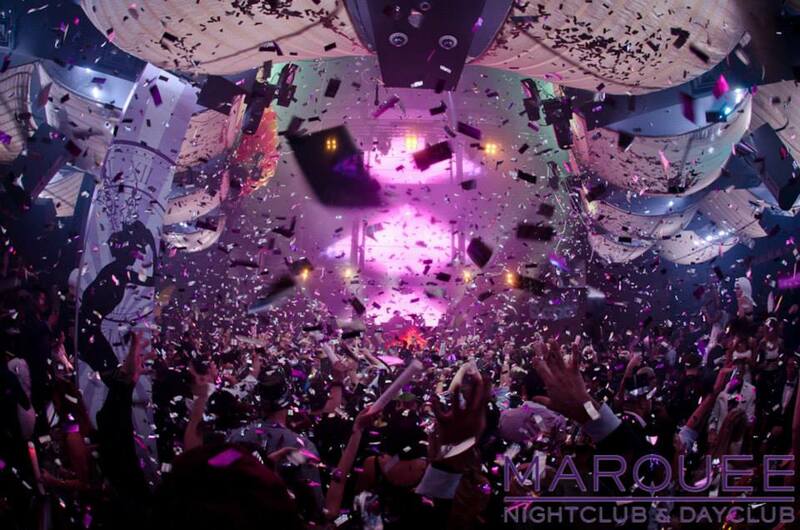 Chuckie at Marquee NYE 2014. Look at all that confetti. Photo courtesy of Marquee. Who’s there: Fetty Wap and a special appearance by Bruno Mars after 1 a.m. Yes, Fetty Wap will be there performing for the night, but let’s jump to the other part of the statement. Bruno Mars will be playing a special show at the Cosmopolitan for NYE, and after that he’ll be, well, probably stopping to catch his breath for a moment then heading over to Marquee. No, you probably won’t get to party/hook up with either star, but you can party it all out at one of the best clubs in town. This is the party to go to when you’re a fan of either Fetty Wap or Bruno Mars, or you just want a solid party in a gorgeous space. Hardwell lighting up Hakkasan NYE 2014. Yeah, these are mostly pictures from last year because we obvious don’t have NYE 2015 pics yet. Photo courtesy of Hakkasan. Hakkasan is keeping it classic this year. Tiesto, the man you may recognize from the giant face that’s been on the outside of MGM Grand this year, or from his immense musical success, will be spinning in 2016 at this superb club. 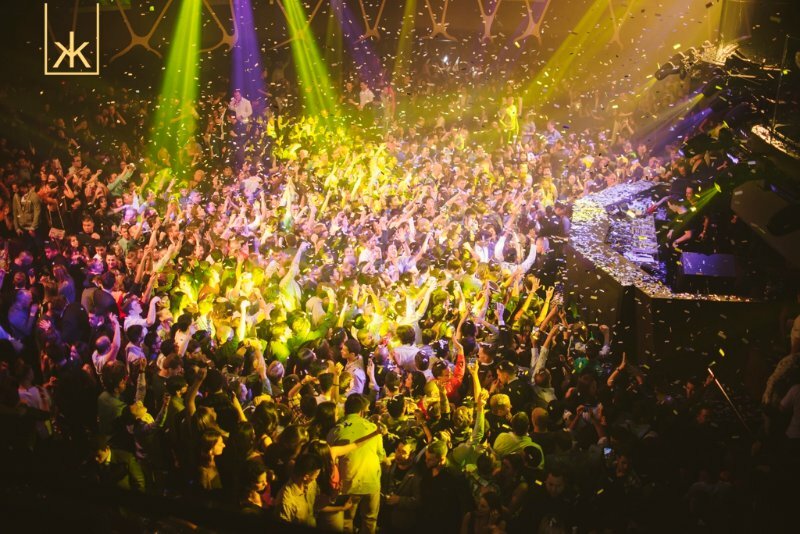 You could make a strong argument that Hakkasan is the best club in Vegas. We’re not going to get into that here, but what we will say is that when you’ve got residents like Tiesto and Calvin Harris, you must be doing something right. This is the party to go to when you don’t want to take chances on whether or not you’ll have a great time – you will here. Iggy Azalea played Drai’s NYE 2014. That’s one of those major music gets we were saying Drai’s always manages. Photo courtesy of Drai’s. Keeping up with their tradition of hosting some of the hottest acts in modern music, Drai’s is bringing in Nikki Minaj to bust 2016 open. The rooftop club has made a name for itself by providing live music in addition to the DJs you find at most nightspots, and this NYE you’ll just why this club has become so popular. This is the party to go to when you’re all about the performance and the show, but you also want to be in the middle of the action and have all your friends, old and new, all around you. 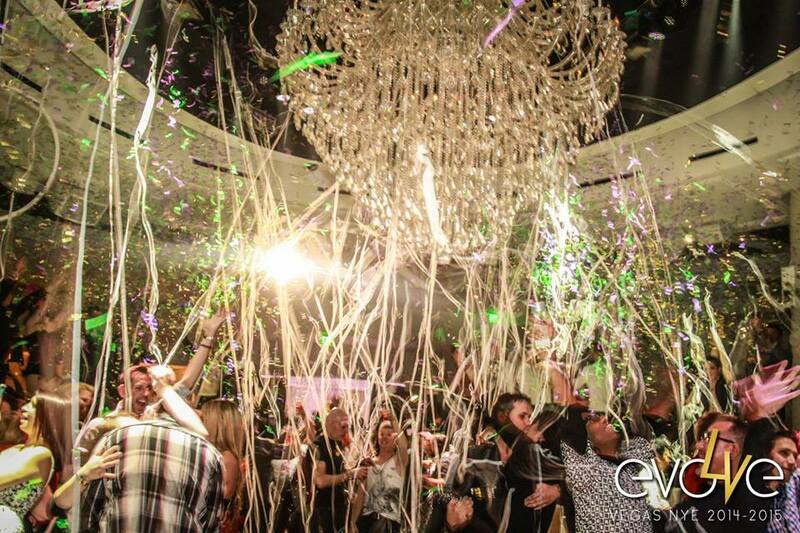 Like we said, Omnia wasn’t open yet, so here’s a pic from their opening. 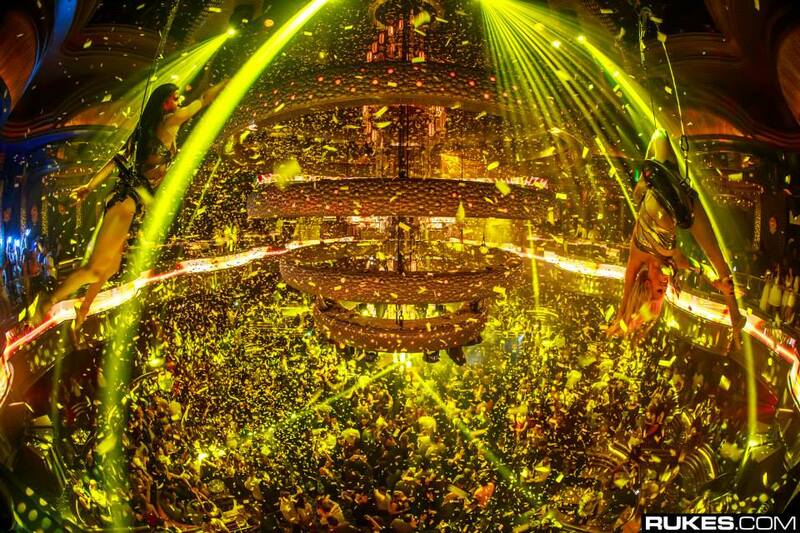 Photo courtesy of Omnia / Rukes.com. There’s Snoop. Told ya he was there last year. Photo courtesy of Tao. 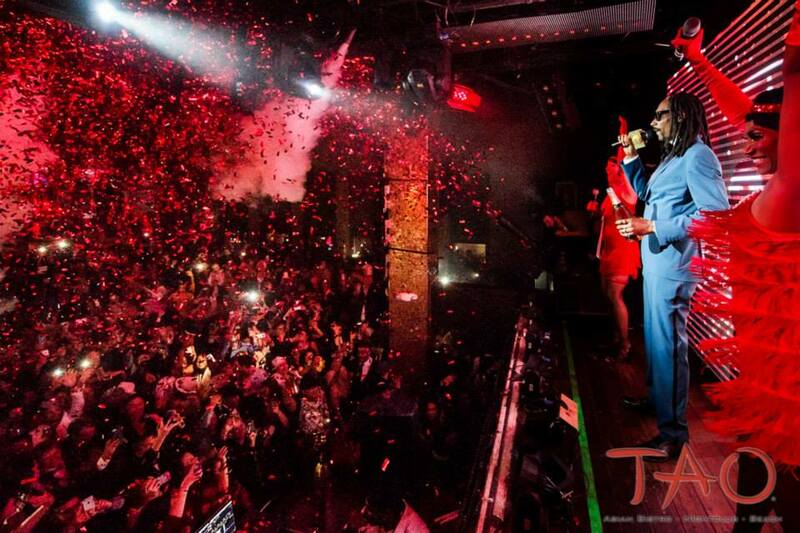 Snoop Dogg, or Snoop Doggy Dogg if you’re old school, or Snoop Lion if you had to take that one year of summer school, will once again bring his Snoopadelic styling to Tao at Venetian for another new year of Snoopness. The tickets also include entry to Lava at Palazzo after midnight, so you can slide over there if you feel you’re getting too Snoop. Like all the parties we list with celebrity guests and performs, we’re pretty confident the average party-goer won’t get to chill with the celebs, but with Snoop, you just might get a contact high. This is the party to go to when you want to ring in 2016 in style and with a chill attitude. 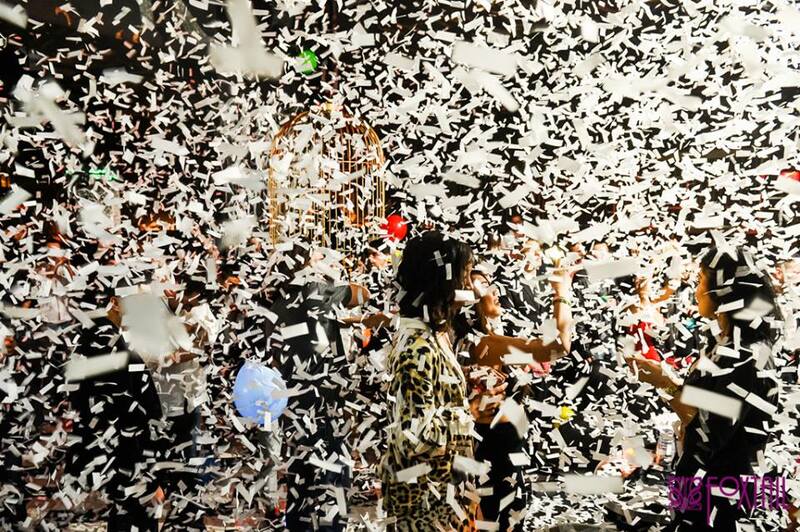 So much confetti. We hope they recycled that. Photo courtesy of Foxtail. He’s one of the Jonaseses, and if you know which one then you’re probably interested in this party. It’s also at Foxtail, and if you know anything about the Las Vegas nightclub scene you know that’s a fantastic location for any party. The club is sleek and modern and perfect for the crowd of club newcomers that are ready for something a little more approachable in their partying. Everything at SLS seems aimed at a younger audience, and this party is likely to be the same. This is the party to go to if you’re a fan of Nick Jonas, or are in the age group to be a fan of Nick Jonas, or are just looking to party with people who probably won’t be ready to drop until the sun is high in 2016. Nobody does a party like Evolve. Photo from NYE 2014 courtesy of Evolve NYE. 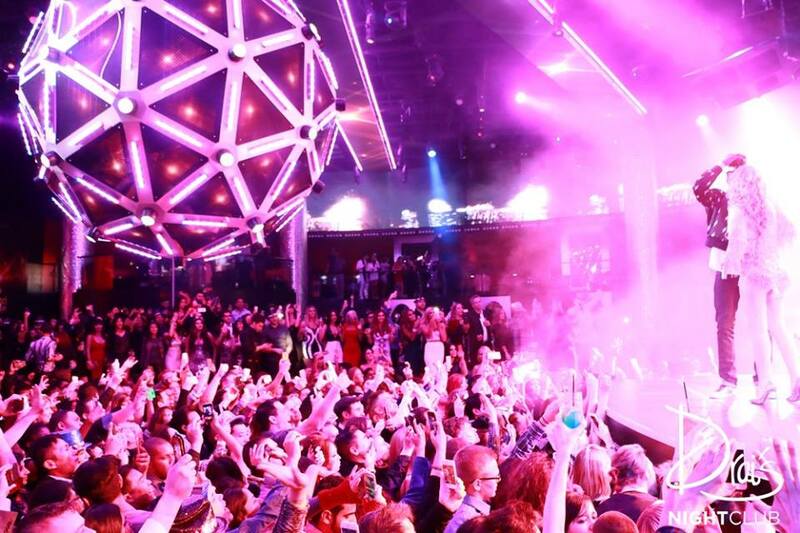 For years, Evolve NYE has been the only LGBTQ party on the Las Vegas Strip. Back at Tropicana for another fabulous ringing in, the party is sponsored by Las Vegas PRIDE, the Tropicana and even Grindr. So get ready for your phone to blow up when you go to see how many hotties are near you. Featuring a DJ and performers, this party is always a hit with anyone who shows up. And the Tropicana provides easy access to the Las Vegas Fruit Loop for all the amazing after parties going on at LGBTQ bars like Piranha and FreeZone. This is the party to go to when you don’t think the rest of them are gay enough for your tastes and you don’t want to have to go stealth just to have a good time. Just a beautiful pic of the Ice Rink and surrounding view. Photo courtesy of the Cosmopolitan of Las Vegas. Maybe the clubs aren’t your thing. We understand they’re not for everybody. Bodies packed together can get a little warm, and you prefer the ice and open air. 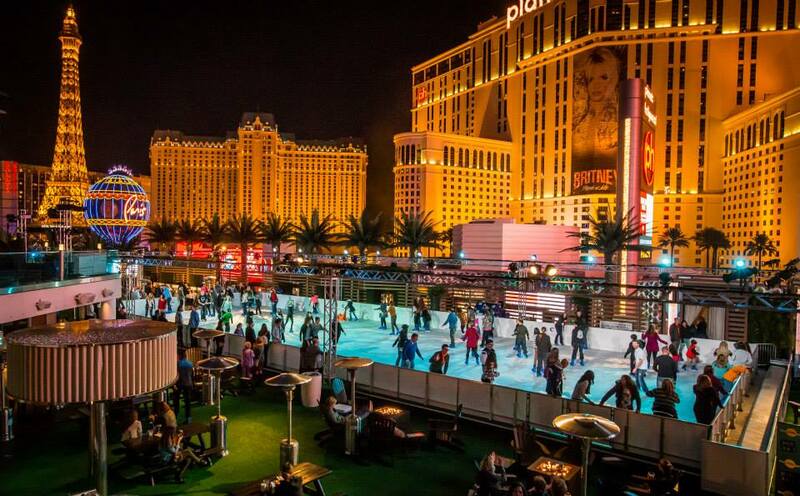 On top of the Cosmopolitan, the Boulevard Pool transforms into the Ice Rink when winter falls, and for NYE the chill spot will be even cooler than before. Skate away or just hang out and watch your friends fall on their butts. Drink some cocktails and try not to light your scarf on fire as you enjoy the Campfire Delight cocktail with its flaming marshmallows. And watch the fireworks from the top of the Cosmopolitan. This the party to go to when you want to ring in the new year with the fresh air and the bright light of the Las Vegas Strip, while sipping a cocktails that’s one part hot chocolate and 30 parts whiskey. 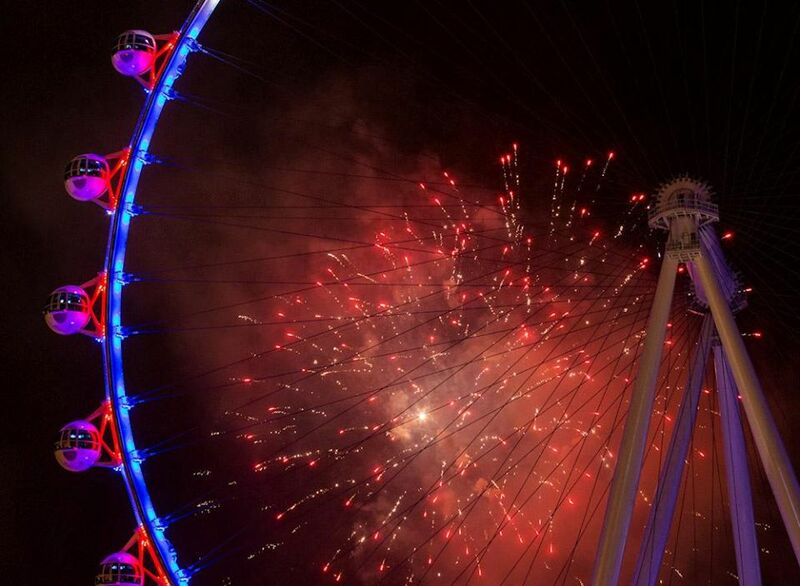 Fireworks behind the High Roller, in case that wasn’t clear from the image. Photo courtesy of High Roller. Sometimes you just want to be confined to a bubble with your closest friends and family as the new year arrives. And it’s even better when that bubble is the cabin of a massive observation wheel that comes with its own bar and a champagne toast. Get a couple friends together and join a party, or get a whole crew and buy out the bubble. It’s your call how you want to spend midnight, but no matter which you pick you’ll be in a prime spot to see the fireworks blasting and the corks popping. This is the party to go to when you want to control the guest list and want the magnificent view to be at the top of the list. Of course these are by no means the only parties going on for NYE in Vegas. Find a full list of the festivities on our New Year’s Page.